Woohoo! This week I celebrated my birthday. (I won't say which one.) I'm a firm believer in a birthday week instead of one day. It's more exciting to spread out the fun. Mom took me shopping for some summer clothes over the weekend. Another day, we enjoyed a luscious dinner at the Olive Garden, complete with Black Tie cake (chocolate mousse, chocolate frosting, chocolate everything). I can still taste it. :) Cards, Facebook greetings, and phone calls finished off the week. Surfing the Internet wave, I discovered an excellent post over at the Edit Cafe. Rebecca Germany noted that authors spend so much time polishing the beginning and middle of their books they sometimes rush through the ending. Check out her tips on how to avoid a meltdown at the end and give the reader a satisfying conclusion. 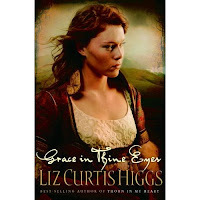 Dawn Kinzer tells a delightful story at her blog. Wouldn't it be nice if everyone tried to make someone's day a bit more pleasant? 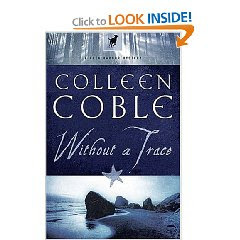 Colleen Coble's book, "Without a Trace," is the first installment of the Rock Harbor Series. Set in Michigan's Upper Peninsula, the story is a wonderful mixture of romance, suspense, and mystery. Our heroine, Bree Nicholls is devastated when her husband and son are in a plane crash. As part of a canine search and rescue team, she's frustrated at her lack of success in locating the downed plane. As if her own troubles weren't enough, a murder sets the town of Rock Harbor into shock. The people wonder about the killer living among them. Will he or she strike again? One of the things I liked about this story was I couldn't figure out whodunit. The author sprinkled throughout the story, but in such an artful way that it was difficult to connect the dots. When the identity of the killer dawns on Bree, I experienced her horror and dismay. Yup, folks, I was up until 1:00 A.M. finishing this book. It's a good thing the next day fell on the weekend. I'll be looking for the other books in this series. I'm thrilled I've found another great mystery/suspense author. Way to go, Colleen! By the way, you can't click on the book cover. On The Master's Artist, Mary DeMuth talks about a different way to promote a novel. While brainstorming with a friend, they came up with this unusual idea. A couple of decades ago, I worked with a guy, who added a new word to his vocabulary each week. He would then work it into almost every conversation. By the end of the week, the staff wanted to run from the office screaming. Tiffany Colter's post brought this story to mind. Are you stuck in a word rut? I first met author, Patricia Hickman, at the Greater Philadelphia Christian Writers' Conference. Her workshop, empathy, and kindness touched my life at a time when I was in the throes of grief. 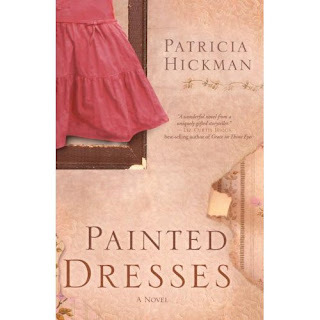 Painted Dresses went on my "To Be Read List." Recently, I purchased a copy, and it went on my nightstand. Two sisters, Delia Cheatham and Gaylen Syler-Boatwright, meet at their father's funeral. Circumstances send them on an unlikely journey. Delia has a knack for getting into trouble and drags big sister, Gaylen, along with her. Gaylen, ever the caregiver, feels a strong obligation to help Delia. The painted dresses in their deceased aunt's cabin send them on a mission. With the delivery of each dress, another layer of their lives is revealed. Old memories surface, tease, and push the women to piece together their childhood. In my opinion, Painted Dresses is character driven rather than plot driven. Each nuance in the women's personalities has significance, and are critical to the grand finale. By the last half of the book, I was having trouble putting it down at bedtime. I completed it at 12:30 A.M. on a work night. Patricia Hickman's writing style and unique way of expressing herself evokes a feeling of, "I wish I'd said that." Her understanding of human nature and how events impact a personality merged with her writing talent to create a memorable reading experience. I'll be looking for other titles by this author. With all the moans and groans about the economy and the future of publishing, I thought we needed a bit of hope. Every time I see a picture like this, I smile. I'm honorary auntie to this Sweet Baby Girl. Thanks to her mom for allowing me to post her pictures. 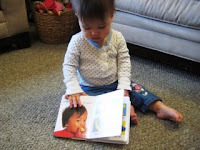 Lest you think this is unusual, Sweet Baby Girl's mom has at least three pictures of her "reading." 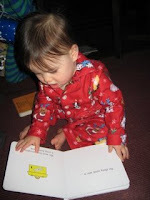 Having just turned one, "reading" books is listed as one of her favorite activities. Mom put up the cutest video recently of her looking through a book and signing the word, "book." It reminded me of a fellow-blogger's post on Baby Sign. Just remember, when Jane Austen penned her classics, none of us were around. "Hi" to all my friends in the PCFW chapter of American Christian Fiction Writers. My local ACFW group and PCFW got together last weekend for lunch, fellowship, and a discussion on how to conduct a book signing. I'm tucking that one in my files for future reference. Do you attend a writers' group in your area? Check around and see if there are others. You'll double your knowledge base and meet new friends. The two groups are hoping to hold a joint meeting again in the near future. Gaye Gaymer Martin wrote a detailed series on Research for Fiction Writing. This link will bring you to Part I, but be sure to catch the rest of them. Her blog is a valuable resource for craft articles. The Edit Cafe, the blog home of Barbour editors, Rebecca Germany and JoAnne Simmons, gives a list of the 2009 Fiction Bestsellers. If you scroll all the way to the end of the page, you'll find the list. Out of 20 spots, Karen Kingsbury snagged five of them, Ted Dekker captured three, and Joel Rosenberg got two. What title beat out the entire field? Hmm, see if you can guess before looking at the list, and put it in your comment. Find out who else made the cut by clicking here. "Even if you are on the right track, you'll get run over if you just sit there." Will Rogers At times, we writers stand still for so long that it's hard to get going again. All around us, others are moving forward. They're learning new skills, submitting to agents and publishers, and building their platforms. Pretty soon, we find ourselves left behind in the dust or crushed by those pressing on toward publication. Another saying I've heard is, "You snooze. You lose." It's time to wake-up from our hibernation, and regain our momentum. Are you with me, gang? Hold me accountable. The area where I'm sitting still on the track is my book. Where are you sitting still? Congratulations Nemil. You'll be hearing from me via email. P.S. See below for my regular Monday post. Yeah, I know. I'm on a food kick. As a kid, I dreamed about having the ability to eat whatever I wanted for breakfast, lunch, and dinner. Why not have cookies and milk for lunch? Why not have dessert before icky veggies? Immediate satisfaction of my desires trumped good nutrition. Unfortunately, such a diet does not provide what the body needs to function properly. A number of years ago, I was working full-time, going to Bible School nights full-time, and living alone. For a couple of months, I lived on frozen dinners and cereal. One morning, I dragged myself out of bed, wondering why I felt so tired. My body didn't have the fuel to keep up with my schedule. A change of diet alleviated the fatigue and generally yucky feeling. As readers and writers, do we exist on literary junk food? Our reading habits will not only affect us as writers, but also as people. Content which mocks and undermines decency and our relationship with the Lord may temporarily satisfy fleshly desires, but it will ultimately harm us and affect our quality of life. The Word of God keeps us on track and focused on His precepts. It may cause us to squirm at times and isn't always candy sweet, but is necessary to a healthy inner life. There's a saying, "You are what you eat." My saying: "You are what you read."